If Your Dog is Healthy, You are Too! Your dog deserves to be happy while he is in your care. You should see to it that your beloved furry friend receives the proper attention that it deserves. Of course, I know that all of us are eager to do this. We adopted these creatures and welcomed them into our home because we want an extra companion to enlighten our lives. When our dogs feel satisfied and happy, we can also get the same gratification. A joyful and energetic dog can keep everyone occupied (in a right way). They can ease the stress that we incurred from our work or academics. When they pounce on you when you arrive at the door is enough proof that your dog feels delighted when you are around. Fortunately, the happiness of your dogs is contagious. Their cute faces are more than enough to melt your heart. They can make you feel loved by just licking your face. We like their clinginess because it is an evidence of the authenticity of their affection to you. The love they can show to you is already a cure for your emotional distress and mood swings. They are the company that would never leave you, even through the tough times. But before all these beautiful things take place, you should secure the wellbeing of your dog first. There are a lot of ways to do this. And many of them don’t require the invention of professional dog trainers. Curious? Check out the next section to learn the simple steps of making your dog bright and beautiful! As pet owners, it is our responsibility to know the behaviour and nuances of our dog. In fact, we should realize their innate habit and temperament that they have, depending on their breed. Moreover, you should know the amount of food and water that they drink. In fact, you should observe the frequency of their waste reduction and the appearance of their stool. Knowing all these things are essential. They will allow you to spot irregularities and abnormalities in their bodies. For example, if your pet is a naturally greedy for dry dog foods, then it would immediately alarm you if they suddenly ignore it. It is a sign that your dog is suffering from anomalies in its stomach or other illnesses. Once you can observe these changes in your dog, you should already consult your local vets. Just like humans, dogs can feel, too. They can experience depression, anger, fear, frustration, and grief. These are pretty common to them, especially if there are sudden changes on your home. Luckily, you can always spot the sway of their emotions. One of the best approaches to do this is to observe and be keen on their body language. For instance, an extrovert dog that suddenly became withdrawn should worry you. If the dog doesn’t move from the bed, this fur friend might be feeling lethargic or sick. Always look at their ears and tail. Are they energetically moving if you approach them? If yes, then maybe your dog is okay. But if they are shying away from you, they might have a problem that only you as a pet owner can address. You can tell if a dog is frustrated if it unleashes its primal destructive nature. If it barks, cries, or whines consistently, then your dog is either bored or agitated. You might want to arrange your home furnishings and living spaces to make your place a lot more conducive to them. You can even bring them to your local park for a run or jog. 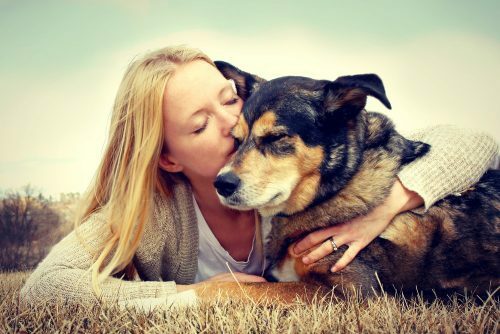 These activities could remove the distress that your pet might be feeling. Some dog breeds appear to be grumpy. However, this doesn’t mean that your dogs are not capable of showing their emotions through their face. If you have been keeping a dog for some time already, you might already familiar with its happy face. Therefore, if their expressions became doleful and sad out of the blue, there is a good chance that they are not in their top shape. A myriad of possibilities might cause your dog to look sad and depressed. One of my best guesses here is that your dog is physically sick. If you keep your home and surroundings peaceful, they should not feel any emotional fluctuations. However, if they still appear gloomy despite the kindness and love that you ushered to them, they might be ill. A quick trip to your local vet can return the glorious stark on your dog’s face! As a pet owner, the happiness and health of your dog should be your top priority. You must be able to identify the symptoms of a weary and perplexed dog. Otherwise, you can’t have any peace of mind at all. That is not an exaggeration. It is a straightforward fact. If we love our dogs, we should feel anxiety whenever they are not on their usual self. Grooming your dog from time to time can save you from this kind of worries. As much as possible, you should set a regular schedule for this activity. It is not just about keeping the cleanliness of your dog. Instead, many consider this as a type of mini-checkup. You can discover unusual changes in their bodies by grooming. For instance, an irritated dog might be infested with fleas. Of course, you can’t deduce this if you won’t clean its furs. For me, this is a big deal. You were able to identify that there is a problem before it becomes severe and malignant. Moreover, keep your dog hydrated and fed. Their stomachs are quite sensitive if it is empty. Your dog won’t always bark if it is full, right? Properly feeding them with healthy treats can make them feel good. Just remember that a happy dog can enliven your day. All those cuddles and embraces that they give can enlighten and soothe your heart. I don’t care how stressful my workplace is. As long as I can go home and see this sight, all those travails and hassles are over. Hi, I’m Lucy Sheppard, founder of Petsinlive– A pets product review website where it assists you in making a better and well-informed decision. Dogs And Cats Living In One House. Will That Be Peaceful? Dog Friendly Holidays Finding That Perfect Location!